This is such a fun time of the year for spending time in the kitchen. It’s sort of a cross between cooking and crafting. 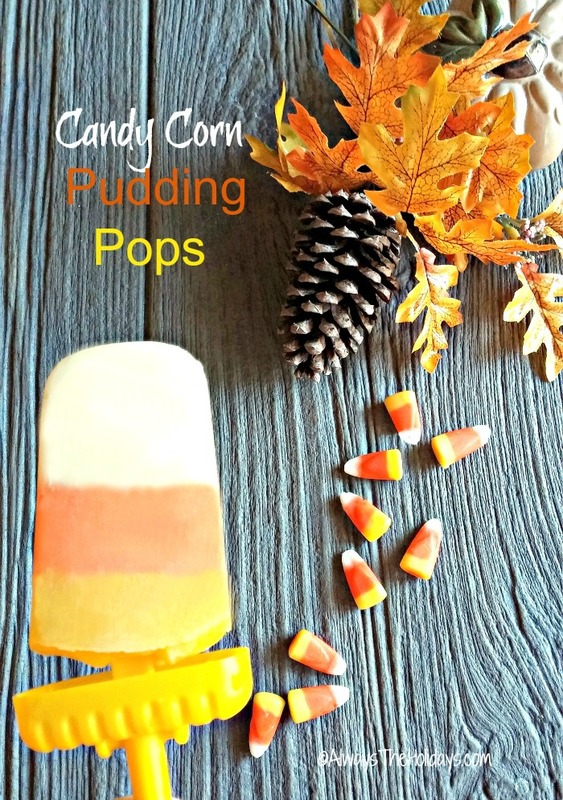 These candy corn pudding pops are a fun treat to make and are the perfect choice for those who love the traditional Halloween and Thanksgiving candy corn. 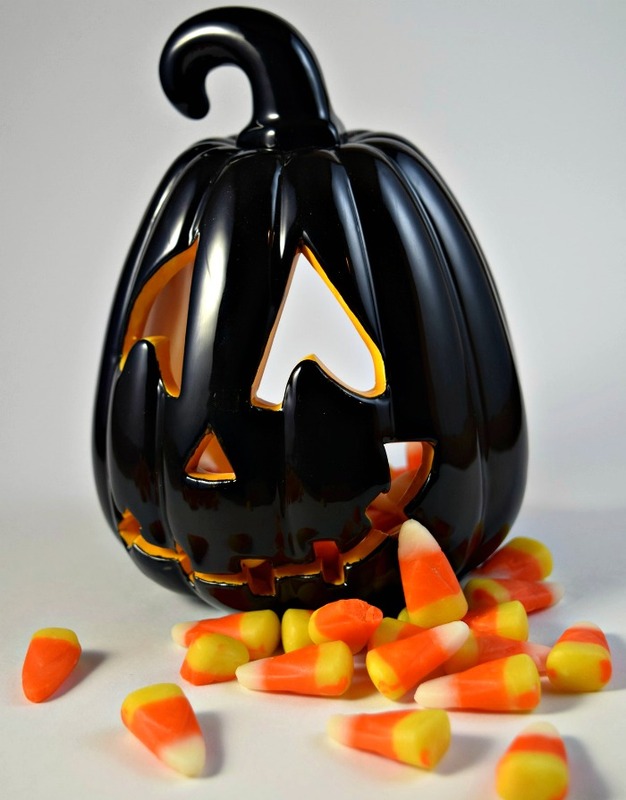 Did you know that October 30 is National Candy corn Day? Find out all about these special days in my National Days Guide. 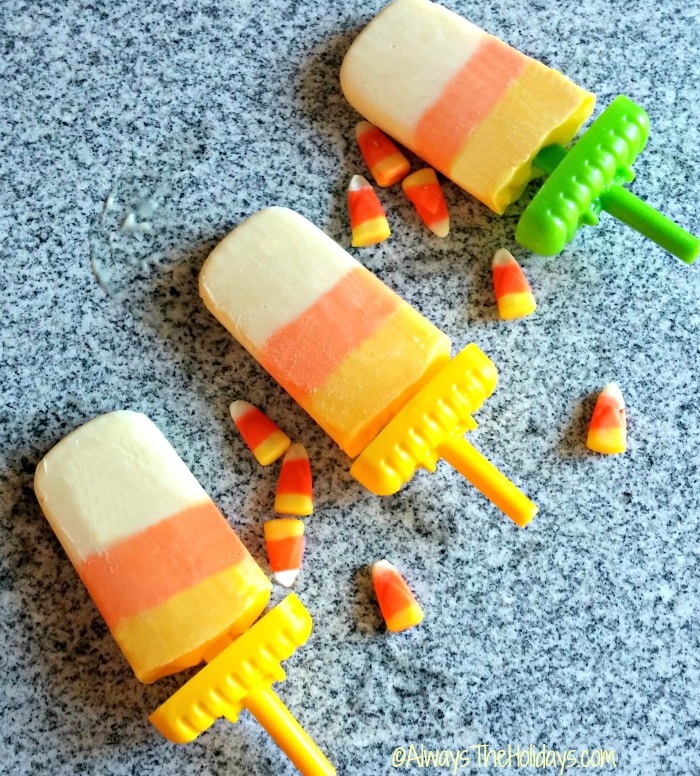 These candy corn pudding pops make a healthy fall frozen treat. I love making home made popsicles using colors of the holidays. See my red, white and blue popsicles here. 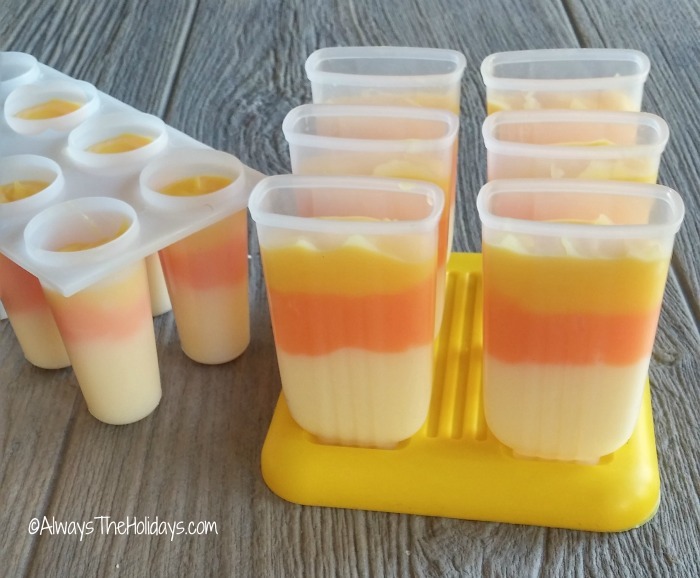 Even though they are normally served during the summer months, we often get hot days for Indian Summer and these candy corn pudding pops make the perfect cool treat. Cadny corn is a favorite of many people during this part of the year. The colorful white, orange and yellow candy is sweet and often used in craft projects and cooking recipes. 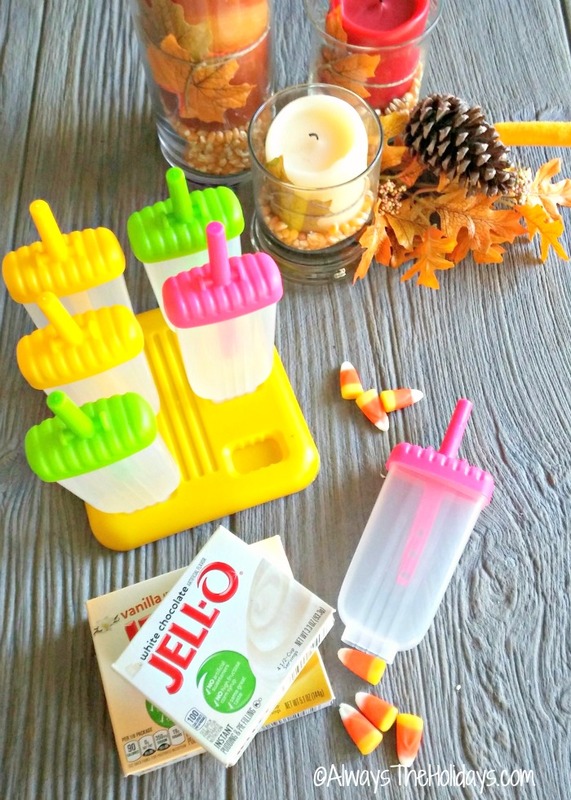 Popsicle Molds I use a BPA free mold with a drip guard. Combine the white chocolate pudding mix and one teaspooon of honey in one bowl, and the vanilla pudding mix in large bowl and then divide it into two smaller ones. Do not color the white chocolate pudding. 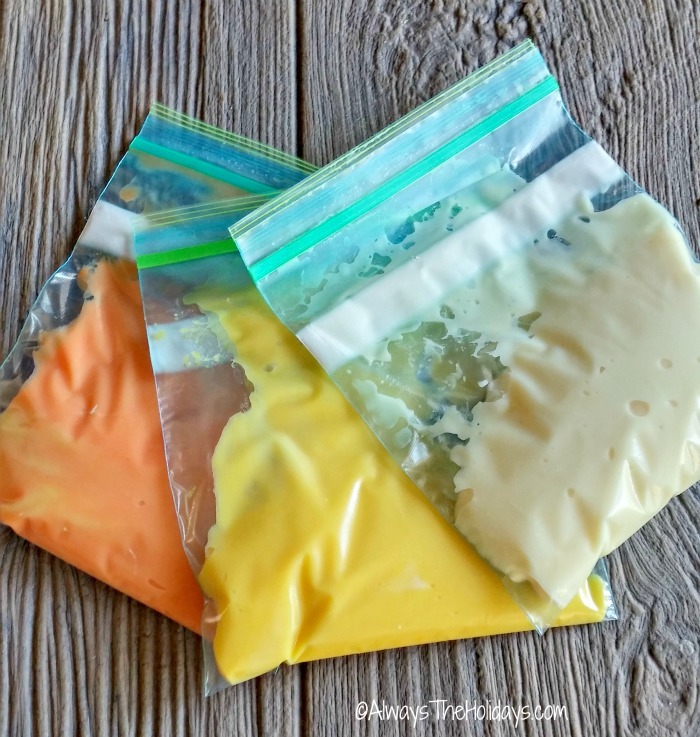 Add drops of yellow food coloring to one bowl of the vanilla and red and yellow to the other bowl of the vanilla pudding until you get your desired colors. Now place the pudding mix into quart sized zip lock baggies and seal. You will be cutting the corner off each one to make it easy to add the pudding to the ice pop forms. 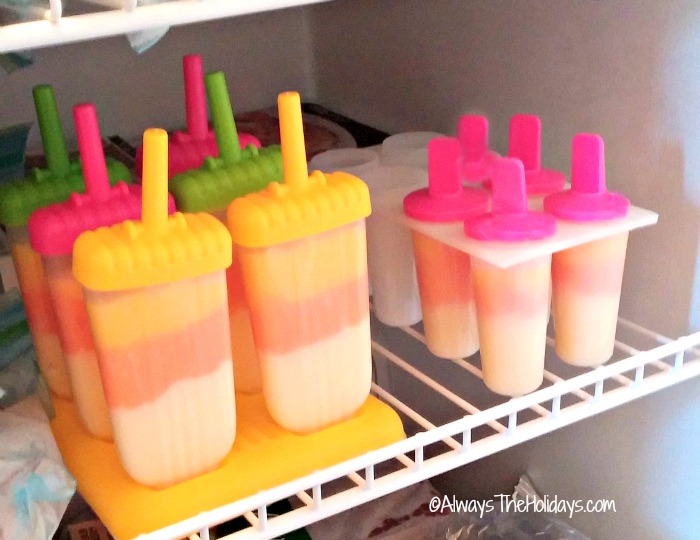 Put the pudding pop molds into the freezer and freeze them for about 3 hours or longer. Once you are sure that they are frozen, run some very warm water on the outside of the mold so that the pops release. Fun, fun, holiday fun. The kids will love these! These candy corn pudding pops are creamy and not too sweet. The honey adds a nice touch to the flavor of each color. Perfect after school snack on a warm Indian summer day. These candy corn pudding pops are a fun treat to make and are the perfect choice for those who love the traditional Halloween and Thanksgiving candy corn. Combine the white chocolate pudding mix with 1 1/2 cups of milk (Not 2 as the box suggests). Add 1 tsp honey. Mix well and set aside. Combine the vanilla pudding mix with 2 tsp of honey and 2 1/2 cups of milk (not 3 as the box suggests) Mix well and divide into two bowls. 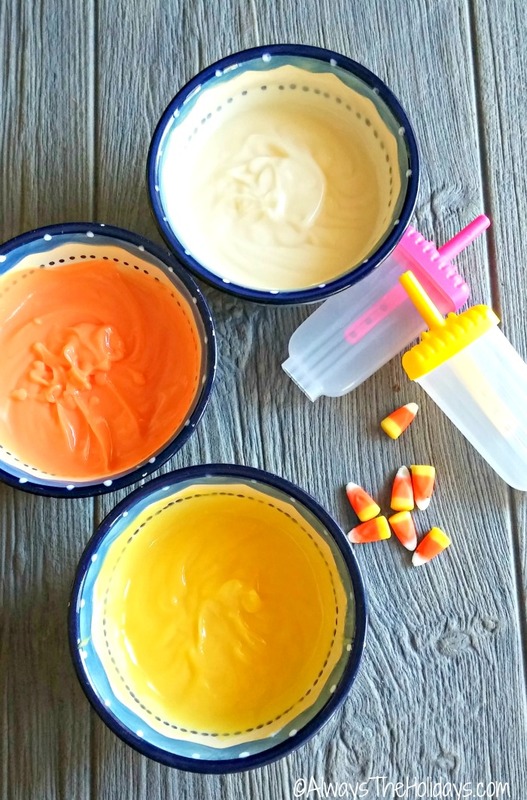 Add yellow food coloring to one bowl of vanilla pudding and red and yellow to the other, a few drops at a time until you get the desired yellow and orange colors. Pipe the pudding into the pudding pop molds, slowly starting with white, then orange and ending with yellow. Tap the molds between each color to get it even. To release, run warm water on the outside of the mold for a few seconds. Enjoy! What a fun recipe to try for the kids! What a great treat! Bet they are yummy! They turned out really pretty too! My grandkids would love these.